...Government Accountability Office (GAO): PRIVATE SCHOOL CHOICE: Federal Actions Needed to Ensure Parents Are Notified About Changes in Rights for Students with Disabilities GAO-18-94: Published: Nov 16, 2017. Publicly Released: Nov 30, 2017. The study and the summary are available for you to read. This is an important study that recommends "Congress should consider requiring states to notify parents/guardians about changes in federal special education rights when a parent moves a child from public to private school. In addition, GAO recommends Education review and correct inaccurate IDEA related information provided by states. Education generally agreed with our recommendation." Take a few minutes and at least look at the summary. CASE will continue to look at this study and consider what steps we may take to help parents at least have informed consent. We would love to hear from you on this situation. Congress will be trying to get some business finished between now and the end of the year. So, we may be coming to you on multiple occasions if there is something happening that may adversely effect students, families, schools, districts, or others in the education realm. We try very hard to not send out more emails than necessary. We hope you will understand and we also hope you will take the action we request. There may be times when you may not think our position is necessary but we are involved with several coalitions as well as CEC and when a "non-education" appearing issue suddenly comes on our radar because of the consequences of the legislation, rule, etc on education, then we do step forward and try to give you the background and suggested plan of action. You can also just check out the CEC Legislative Action Center. Speaking of taking action — Have you registered for CEC? The CEC convention in Tampa, Florida, Feb. 7-10 and the program will be amazing! This will be a conference you do not want to miss. Check out all the information from programs to hotels to workshops at the dedicated conference website. But, remember, you want to come in on Tuesday so you can have a full, free breakfast before our CASE meeting, Wednesday Feb. 7. Hope to see you there! CASE NIGHT tickets are on sale and going fast! We are so excited about this year's CASE Night — a dinner cruise on Tampa Bay! The boat will leave just steps away from the convention center so no added transportation. Tickets will be $65 but remember it is sponsored so for that amount, you are really getting an event that is worth much more! Our very special sponsors are Star Autism and Sonday System! The tickets are limited so get your tickets today! We usually have the CASE Hybrid in February but since CEC is in February this year, we are doing it the first full week in March. If you haven't looked at the Hybrid as a great professional learning opportunity for your school/district, then you need to re-think about it! We even will give you Hints on how to get it all together! This year we will once again have two extraordinary speakers and two different subjects — so you may want to invite different folks on the different days. Remember you pay one low price and can have as many as you can accommodate in your session! Last year we had 99 virtual sites in 36 different states! But of course, you can join us on-site at the lovely Westin Hilton Head Island, Hilton Head Island, South Carolina. Register today — and don't forget to add in the DVD for future use! We had another week of increased activity on our poll! 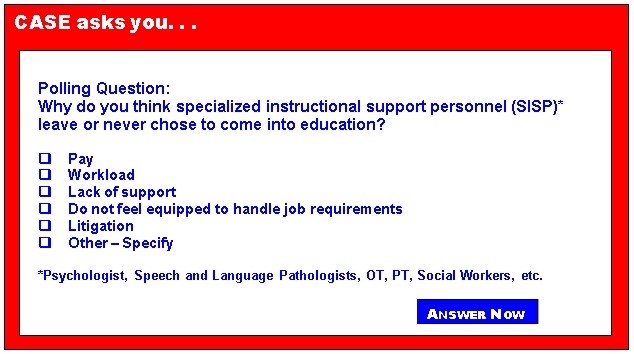 The question last week was "Why do special education teachers leave the field?" This is a very important issue and will be discussed at the CEC Convention at the very least in the Representative Assembly. The next few weeks we will have several polls related to the retention and recruitment of teachers, specialized instructional support personnel, and administrators. Your responses are important for our CASE representatives to the RA as they flesh out their comments. Please answer these polls and go to the CASE Facebook page and continue the discussion. The number one answer with 41 percent was work load. Coming in second with 24 percent was Other with most of them being combinations of those factors listed, saying all were important factors with one major addition — litigation. At third place with 18 percent was not feeling equipped for the job. Fourth place at 12 percent was not feeling support and at last place with 6 percent was pay. I think there are several of these reasons we have some control over and can work together to develop strategies. I was thrilled and not surprised that pay was not even in the top three! Thank you for answering this poll and be sure and answer the related one today! Try to do some deep breathing as the holiday season starts ramping up. The traffic, the stress, the issues our students and staff have, all these things can start to overwhelm the strongest of us! Be kind to yourself and to others—take a deep breath! Students who fail math or English in eighth-grade are 75% more likely to drop out of high school than their peers. These concerns have become more prevalent with the advent of the standards and accountability movement seeking to make course work more intellectually demanding. With these increases, there is a clear need to develop and provide students with extra help and support in order to succeed in school. Schools offering extra help and support, especially in the early stages of a student’s education, can guide at-risk youth on the path towards academic success, diminish the likelihood of behavior problems, and increase the likelihood of high school graduation (Balfanz, Herzog, & Mac Iver, 2007). 2-week continuing resolution? — Urge Congress to invest in education programs! CEC celebrates International Disability Champions!